Three drawers for keeping clutter at bay and a floating shelf make this sofa table a practical choice for your home. Its rustic style and unique details, however, make this a piece you will love for years to come. This sofa table is a perfect place to display accent pieces, or even a vase of flowers, as the bright colors will pop against the table's dark finish. 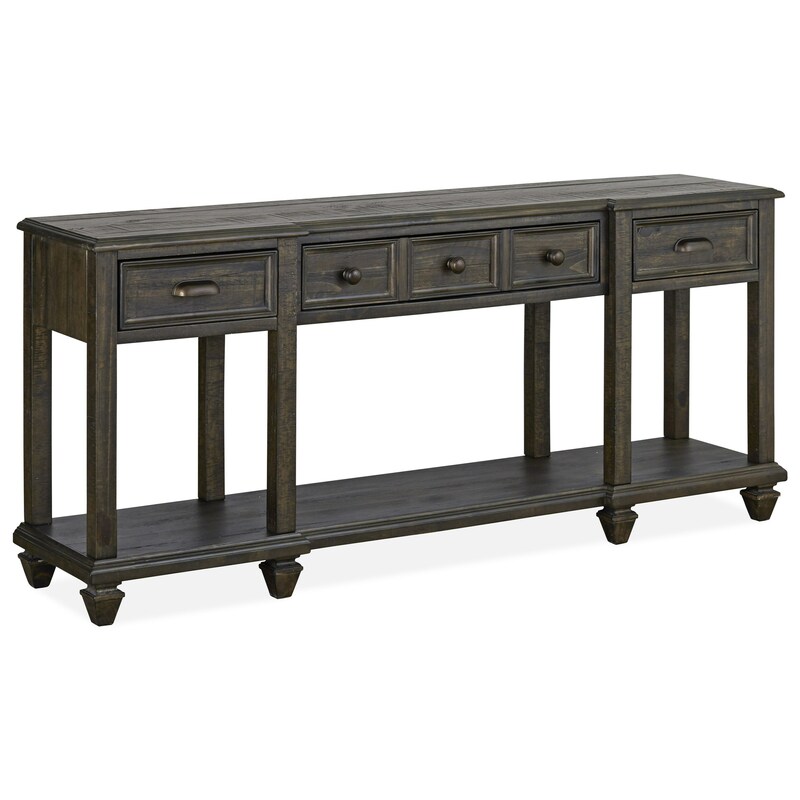 The Burkhardt Rustic Rectangular Sofa Table with Floating Bottom Shelf by Magnussen Home at Miskelly Furniture in the Jackson, Pearl, Madison, Ridgeland, Flowood Mississippi area. Product availability may vary. Contact us for the most current availability on this product. The peppercorn finish on the pine veneers and solids creates a relaxed look for this rustic collection. Details such as the hammered hardware in a dark bronze finish and the ruff sawn plank tops bring in the well-loved, rustic feel for these pieces. Additionally, because of their dark finish, these pieces are able to make any color scheme really pop. The Burkhardt collection is a great option if you are looking for Rustic furniture in the Jackson, Pearl, Madison, Ridgeland, Flowood Mississippi area. Browse other items in the Burkhardt collection from Miskelly Furniture in the Jackson, Pearl, Madison, Ridgeland, Flowood Mississippi area.